Draped fabric cascades loosely down the front of this ultra-lightweight jersey cardigan sweater. Ribbed banding trims the neckline and open placket, which falls in an uneven line to the hem. Long sleeves. Sheer. 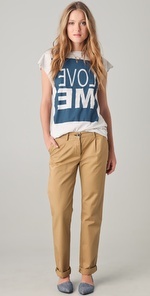 These slouchy twill pants feature slant hip pockets and welt back pockets. Button fly. Pleating at front. * 10″ rise. 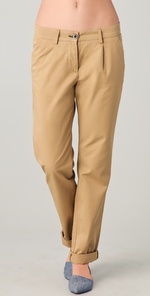 31″ inseam (uncuffed). his scoop-neck print silk-jersey dress features ruched panels at the hidden back zip and pleating at the shoulders. Draping at bodice and double-button keyhole at back. Pleated waist. Draped 3/4 sleeves. Lined. * 42″ long, measured from shoulder. This crew-neck silk-chiffon dress features a button keyhole at the back. 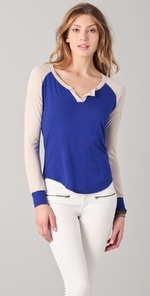 Removable ruffled collar and asymmetrical hem. Sleeveless. Lined. * 46″ long, measured from shoulder. 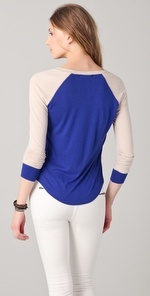 This two-tone jersey top features a split V neck and zigzag topstitching. Long sleeves. * 23″ long, measured from shoulder. * 50% pima cotton/50% modal.